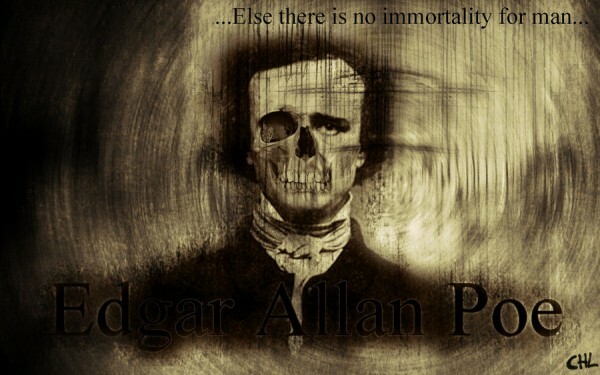 On this day in 1849, Edgar Allan Poe died at the age of forty under mysterious circumstances. For more information, read "Mysterious for Evermore" by Matthew Pearl, an article on Poe's death from The Telegraph. Pearl is the author of a fascinating novel about the subject, The Poe Shadow. Seven years ago, on the occasion of Poe's 200th birthday, I took over the StarShipSofa Audio Science Fiction Magazine to host an hour-long tribute to this pioneer of the short story, luminary of Gothic horror, father of detective fiction, and giant of science fiction. You can listen to the podcast here at the StarShipSofa website, or download it here, or access it via iTunes. If you listen, I hope you enjoy my celebration of Poe's life, works, and legacy! * Free for adoption, here is my narration of Poe's "Mellonta Tauta." If you listen, I hope you enjoy! * In this episode of StarShipSofa, I review the "Madness: Insanity in the Works of Edgar Allan Poe" temporary exhibit at The Poe Museum, a place I always love to visit. I thought this was a very insightful exhibit, and in my "Looking Back on Genre History" segment I try to pass some of those insights along to listeners. If you check it out, I hope you enjoy! While we're talking Poe, I invite you to vote on my Goodreads list of "Fiction Featuring Poe as a Character." Here is the Biography documentary special devoted to Poe. If I had to name my favorite Poe work, the Dupin tales would be high on my list, as would "The Premature Burial" and "The Masque of the Red Death," but I think "The Fall of the House of Usher" would have to be my choice for my favorite story. My favorite Poe poem is "Alone." What is your favorite work by Poe? What was it --I paused to think --what was it that so unnerved me in the contemplation of the House of Usher? It was a mystery all insoluble; nor could I grapple with the shadowy fancies that crowded upon me as I pondered. I was forced to fall back upon the unsatisfactory conclusion, that while, beyond doubt, there are combinations of very simple natural objects which have the power of thus affecting us, still the analysis of this power lies among considerations beyond our depth. It was possible, I reflected, that a mere different arrangement of the particulars of the scene, of the details of the picture, would be sufficient to modify, or perhaps to annihilate its capacity for sorrowful impression; and, acting upon this idea, I reined my horse to the precipitous brink of a black and lurid tarn that lay in unruffled lustre by the dwelling, and gazed down --but with a shudder even more thrilling than before --upon the remodelled and inverted images of the gray sedge, and the ghastly tree-stems, and the vacant and eye-like windows. I find adaptations in film are interesting; Corman's The Tomb of Ligeia, Fellini's Toby Dammit, and the George C. Scott The Murders in the Rue Morgue are all favs. Corman's TPB and TPatP scared the crap out of me as a young child. The recent movie, The Raven, is disturbing but beautifully filmed. Oh, wonderful choices all! Yes, yes, yes! I agree with you about The Raven, by the way. I really had my reservations about the casting of John Cusack (though I usually like him quite a lot), due to his size (he's sort of the anti-Poe in physical build) and his utter lack of accent (something I've loved about Jeffrey Combs's more authentic portrayal), but the film was so clever and compelling, and his performance strong in its own way, that I just went with it. And as you say, it's a stunningly beautiful film visually, too. Halloween...Poe...does anything more need to be said? :) I enjoy your StarShipSofa Poe episodes! My favorite stories are the Dupin stories, The Premature Burial, and most favorite, The Fall of the House of Usher. Annabel Lee is my favorite poem since I memorized it in ninth grade (many, many, many years ago) but I also love The Bells, The Raven, and Spirits of the Dead. Yay! Thanks for listening to my SSS episodes! :D I love your choices -- and the fact you memorized "Annabel Lee" in the ninth grade. Have you heard Marianne Faithfull's reading of the poem? Striking, I think. Wow! What a treasure trove of Poe-related reference links! I've Instapapered & Favorites-filed like crazy after reading this. Thanks for sharing all this inspirational material. Oh, thank you for your kind words! I'm so happy this is of use and interest. Favorite story is probably The Pit and the Pendulum, with The Fall of the House of Usher coming in a close second. Terrific choices! The Pit and the Pendulum hits hard every time I read it. A related question: What is your favorite of the Roger Corman Poe adaptations? While Corman's filmography is all over the place regarding quality, his Poe adaptations are often considered to be among his best work. I have something of a soft spot for The Pit and the Pendulum, too, though (because?) it's rather crazy!